Tired of copying and pasting URLs from weblogs or forums where someone didn't make a real link? Plain Text Links 0.3 is an extension for Firefox that lets you right click on URLs in plain text and open them as if they were real HTML links. Now in version 0.3, there is only one menu item—"Open Selected URL". 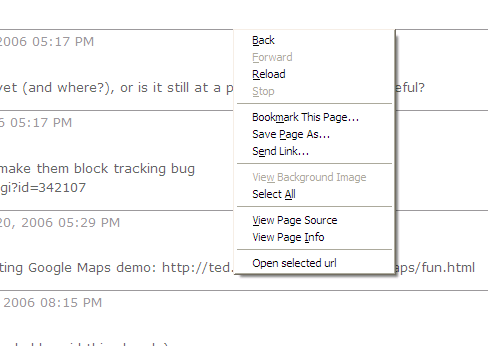 Simply clicking the menu item will open the link in the current tab. You can control + click or middle click the menu item to open the link in a new tab, or shift + click the link to open it in a new window. Unlike in previous versions, you no longer need to select the URL before you right click. Just click and open! Plain Text Links version 0.3 is only compatible with Firefox 1.5 or greater. If you're still using Firefox 1.0.x, you should really upgrade. If you cannot, please install Plain Text Links Version 0.2. Plain Text Links does work with Firefox 2 alpha and Firefox Trunk Builds (Minefield), however the max version specified in the install.rdf file is 1.5. I believe this is proper behavior. You may want to use Nightly Tester Tools if you want to install this extension on an alpha or beta Firefox. Plain Text Links is Free Software, distributed under the MPL/GPL/LGPL tri-license. Automatic fixup of URLs, including handling of common obscurations such as "hxxp://"